LIS365 is an advanced integrated Laboratory Information System. It leverages as a modern platform with an experience as market-leading LIS. It has the tools to help maintain a productive laboratory despite staffing challenges and changing healthcare environments. LIS365 through its laboratory information management systems empowers labs of all sizes to enhance revenue and improve customer retentiveness. This is done by increasing efficiency, streamlining workflows, reducing turnaround times and ensuring patient safety. Our extensive consulting and in-depth analysis has helped many clients to automate their Advanced Laboratory Information Management System Software. The team at AXGuru has worked onsite with client team in order to understand their business process and proposed a solution to automate their Laboratory System. This system offers a range of customizable features to serve the purpose of maintaining the laboratory information management system. This will be a web-based solution that will retrieve data from client database and/or from various machine related information as per client requirement from cloud. It will also help to notify admin about machine situation and its maintenance requirements. This module will list all the collected lab billings of the patient. This module will provide complete information about lab test, bill, amount etc. This module manages all lab inventory. For example, tracking of equipment’s used in a particular test. This module manages all types of billing reports like Insurance, deposit reports etc. This module manages all patient reports in one folder. This module manages and stores all lab reports or test reports we do in our laboratory. Technologies are Microsoft ASP.Net, SQL Server 2017, and Microsoft Azure for cloud-based deployment, Power BI for reporting. The online LIMS system was successfully launched after a year and a half of development. AXGuru dedicated team has already developed a comprehensive solution. We are continuously developing and innovating new functionalities and features for achieving the customer’s business objectives. Rules-based technology, configurable rules improve efficient workflows and error-proofing. LIS365, an interactive dashboard that allows users to view laboratory performance metrics. An interface monitoring tool, that includes user alerts to ensure that all interfaces are functioning as intended. LIS365 has comprehensive report functionality that enables us to memorize reports. LIS365 provides sample receiving at the Requisitions Menu for streamlined access by lab personnel. Quality Control Management, which eliminates the extra steps required to order daily QC. Extremely scalable, flexible, and customizable, outstanding support and services organization. LIS365 Customer Engagement solution can streamline many customer engagement and administrative tasks. Integrating your systems for appointment scheduling, patient transfers and discharges, and bill processing can save valuable time and effort that can be better channeled toward patient’s care. With a CRM solution, vital information transfers become automatic and almost instantaneous, lost lab reports and vast piles of paper can become a thing of the past, and you can even track and monitor your inventory of supplies in real-time as medications are administered and other supplies are used. Improve Costs and Collections LIS365 Customer Engagement can significantly reduce the human interface for various tasks. As many of these once time-consuming tasks become more automated, our operational costs drop, because we can do more with fewer man-hours. Properly implemented and used, the LIS365 CE can also help us identify solutions to cut costs in other areas of your organization. For example, integrated stock management can allow us to reduce stock outages and inventory costs. Collections can be increased as documentation is improved and claims submission processes are organized. LIS365 Customer Engagement helps you to record key client information over numerous channels and in addition aggregate data & information form all your back-office operations. LIS365 Customer Engagement provides the ability to group Tests into Panels, using the Panel management. Panel testing is also a useful tool to evaluate the proficiency of laboratory technicians. 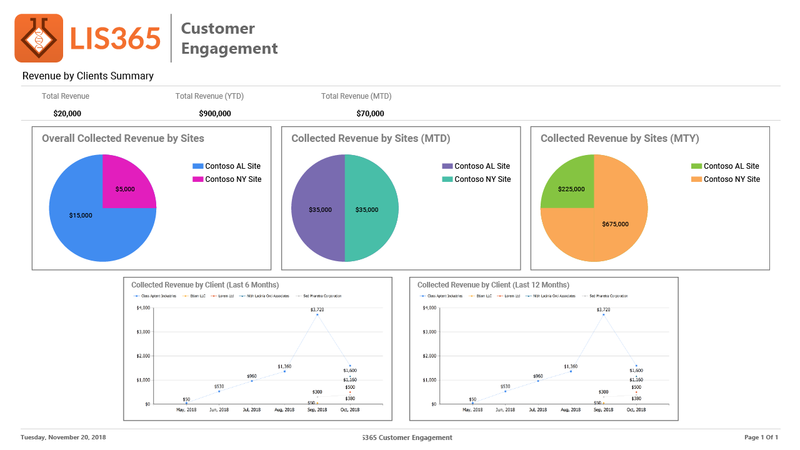 LIS365 Customer Engagement has generally been characterized as a single comprehensive piece of solution that manages lab workflow, reporting and billing. Rules-based technology, configurable rules improve efficient workflows and error-proofing by aiding in decision making throughout the testing process. LIS365, an interactive dashboard that allows users to view laboratory performance metrics, eliminating manual processes and increasing efficiency. An interface monitoring tool, that includes user alerts to ensure that all interfaces are functioning as intended. This allows user to define fail parameters such as file counts, export queue pending count and export queue pending minutes. LIS365 has comprehensive report functionality that enables us to memorize reports, which can be saved, grouped on main screen and accessed via tile. Interactive and user-friendly dashboards to view panel count trends, panel counts and turnaround times. Simple keys are used to eliminate excessive navigation and streamline workflow. LIS365 Interface Supports bar-code and label printers. Interfaces to billing module, daily patient Check In, Patient Module and more. LIS365 Interface supports standards of HL7, ASTM, TCP/IP and other protocols. LIS365 interface monitor allows user to define fail parameters, file counts and service down minutes. User notifications via email or printed alerts. LIS365 built on Microsoft SQL, cloud enabled LIS with segmented design to support high volume. High- availability and disaster recovery. Fast processing times for active, historical and QC data. Results live online for more than 60 million of patients. Maximum scalability offered using Multi-tier structure with web connectivity. Configurable rules to acquire workflow needs throughout the testing process. Customized features to increase efficiency. Database filtering prior to query. LIS365 provides flexible options to set up auto-delivered reports with multiple formats. LIS365 can import and export data from other databases. LIS365 supports CPT, ICD-9 and ICS-10 codes system. LIS365 can edit results which includes audit trails and more. Displays previous orders and previous results automatically. Displays summary reports with graphing. LIS365 can produce and deliver reports In-house, through Fax, web and more. It has comprehensive reporting functionality which includes memorized reports, reports can be grouped and saved on the main screen or it can be accessed via tile. Batch Reports can also be memorized. Extensive support for configurable Westgard rules to achieve the laboratories Quality Assurance objectives. Levey-Jennings graphs will be maintained and displayed precisely along with perceptive rules to monitor QC. User-defined date range summary reports. LIS365 stores QC results completely, not only summaries. Data & information management, Reporting and integrations are important segments of an efficient MDx lab LIS. LIS365 for Molecular Diagnostics not just addresses these requirements, it surpasses them. Speedy outgrowth in molecular diagnostic (MDx) testing and integral administrations is being driven by the headway in human genotyping and a change to a value-based care model. This expansion is generating information and workflow management, compliance, reporting and testing modality compensation policy issues that must be settled for today's MDx labs to flourish. Regardless of whether your facility is an initial phase MDx laboratory, an organized lab encountering growth, or an organized lab hoping to increase efficiencies and grow new income streams, LIS365 is the ideal solution. We have over 16 years of experience in Billing, A/R Recovery, Forensic Billing and Billing Consulting. Why Outsource Billing to Us? Lower Overhead-Staff is more expensive than ever now. More than ever outsourcing makes fiscal sense for practices now. Lower Denial Rate-Most Medical professionals state that overhead and denied claims are the two biggest profit killers in their practices. When your claims go out they need to be clean the first time, every time. No Long-Term Commitment Required Maybe you are new to outsourcing billing. We understand that can be unsettling in the beginning. We are delighted in the chance to gain your business one month at a time. Maximum Revenue-The bottom line is your bottom line. Focused Billing Solutions will bill everything that can be billed, clean up you’re A/R and bring in every dollar you have worked so hard to earn. A lot of physicians or owners know there is a problem but just are not for sure what aspect of the billing is causing the issue or some do not realize that they are collecting less than what they should be. And sometimes practices have a problem with their in-house system because they may not be highlighting on going issues if they themselves are a part of the problem. We can review current billing practices and identify areas of concern. When these issues are brought to your attention and identifying where they may be starting from you can then start to repair the system and end any new loss of revenue and move forward with a brighter future. Designed with HIPPA regulations as a strict guiding principle to integrate with EMRs, EHRs, Analyzers, CRMs, and more to increase efficiency, minimize human error, and protect transmitted patient information. 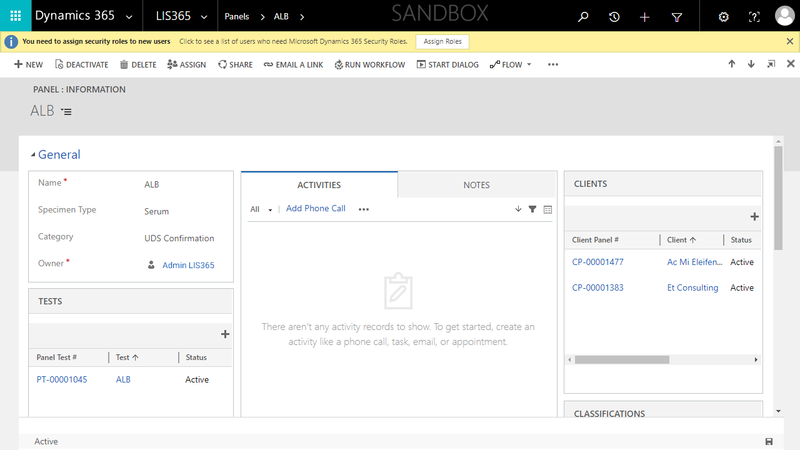 LIS365 has designed its Services Module to manage client information and to improve the customer’s service and their experience. It documents patient inquiries, tracks call records, flags accounts which requires follow up and more. It has automated and consolidated system. It permits total visibility of labs performance expectations and instantly resolves issues. Monitoring temperature and humidity is a crucial aspect when it comes to maintaining your equipment, chemicals, and samples. LIS365 offers integrated solution with refrigeration equipment and temperature sensors. Visibility Anywhere: Check your laboratory from anywhere, at any time. You can track temperatures, pressure, humidity levels, door status, leaks and more providing you with a complete end-to-end temperature monitoring solution for all your laboratory equipment. Customizable Alerts: Real-time alerts sent directly to your phone can be modified by recipient and delivery method to fit your specific needs. Multiple Location Set-up Capability: All units in separate locations can be synchronized together for multiple location monitoring. As an important document cannot be presented in an electronic format every time. 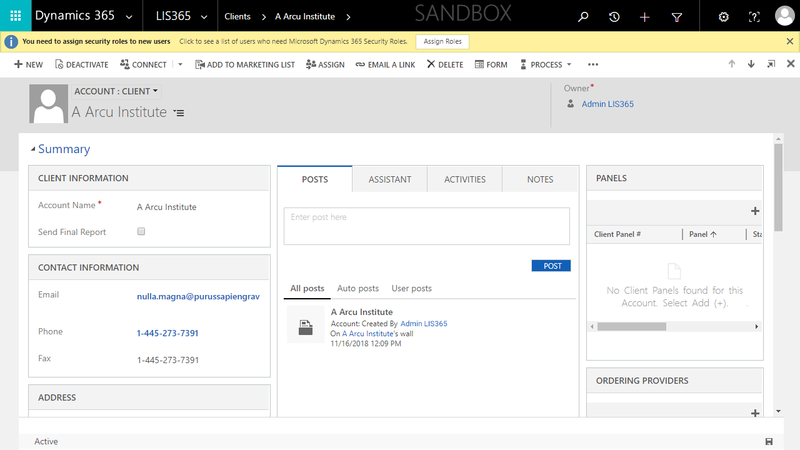 This module provides users, the flexibility to store their documents in LIS365. Documents can be attached at Patient as well as requisition level and they may include any file type without any limits on file size. Prescription adherence Module permits users to attach their prescribed medications to the order. The software determines if the testing results are consistent or inconsistent with the prescription. The drug adherence report certainly depicts the testing results and their consistent and inconsistent status. LIS365 documents the repository location of specimens which follows testing and enabling users to find reserved specimens easily and instantly for retesting. Specimen Storage is designed to provide reference labs and other facilities performing moderate to high-volume testing an opportunity for significant efficiency improvements. Flexible to handle variety of test configurations and for multi-specialty lab tests. Other features include Patient registration, specimen receipt and more. The inventory management functions of the LIS365 allow end-users to know where everything has been and for how long. The system manages stock supplies and reagents, as well as assigns automatic re-order alerts. LIS365 Permits Necessity Checking for lab orders. This module provides all the medical essential information you need to submit to the lab orders. LIS365 provides simplifying access to the required information by consolidating laboratory data into a centralized hub. An expanded library of reports allows user to evaluate different activities of patient, financial, quality control. Routine reports can be generated through this module and they can also be scheduled to run at user-defined times. LIS365 Reporting Module provides financial reports, Management reports to monitor performance, increase productivity and to make apprized business decisions. Financial Reports permits user to monitor daily costs, reimbursements, billing information. QC Reports will assist in monitoring the day to day QC activities and identifying shifts and trends. Management Reports will assist in identifying staffing challenges, test menu selection and possible reimbursement problems. Patient Reports are accessible in user-defined formats and will be specified as per provider. Electronic billing is becoming overly complex day by day. Labs needs to verify claims against patient insurance benefits. Mistakes leads to delay the payment, as rejected claims need to be corrected and then resubmitted. LIS365 offers laboratories the flexibility of billing directly to the insurance, releasing physicians from the strain of entering information manually with the specialized functionality and rules that meet payer requirements. Claims Processing and Tracking: This portal, tracks to ensure that claims are filed accurately, and payments are made promptly. Coverage can be verified instantly, and notifications will be sent if there are any mistakes detected. The status of claim can be checked at any point in the revenue cycle. Patient Billing and Payment: This portal secures patient billing and the method of sending patient statements. Patient statements can be delivered by post or by submitting electronically to be paid online. Eliminate Insurance Claims Fraud:LIS365 Billing Modules stops medical claims fraud by checking to ensure claims information is accurate and valid before submitting any claim. Auto Posting: LIS365 will automatically receive payments from patient's insurance carrier. This feature will improve your cash flow and eliminate data entry errors. LIS365 automates your claims processing and premium billing invoicing with a payment system that scales for large populations.